A turbocharger takes exhaust gases from your engine, uses them to spin a turbine and pressurize air. That pressurized air (boost) is then forced back into your engine. The first thing the exhaust gases encounter when they leave your engine is the waste gate. The wastegate controls how much boost your turbo creates, by regulating how much exhaust gas reaches it. 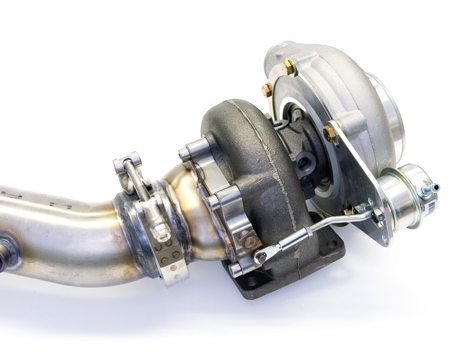 If the turbo reaches its boost limit, the wastegate will open, and allow exhaust gas to bypass the turbo completely. 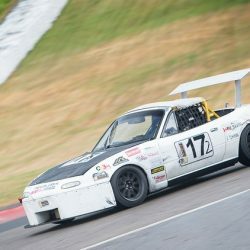 How does the wastegate know how much boost the turbo is creating? It’s connected to the turbo by a vacuum line. Wastegates have a spring inside of them that dictate how much boost is allowed. 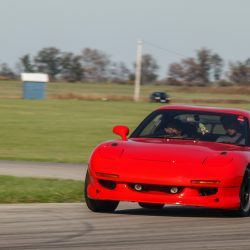 To change the amount of boost your turbo is allowed to create, you can either swap out that spring or splice a boost controller into the vacuum line. 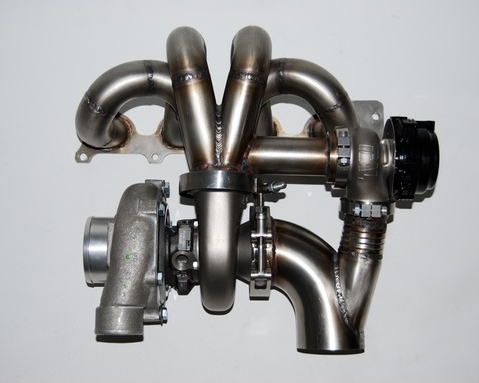 Also, wastegates can either be internal (built into the turbo) or external (bolted to the exhaust manifold). 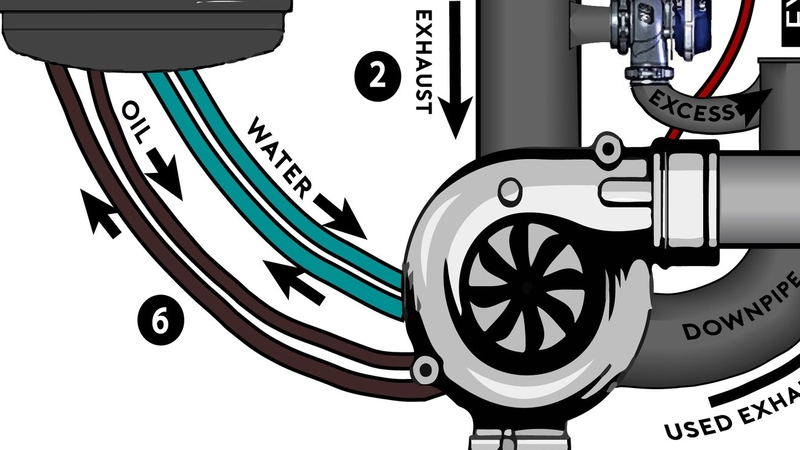 The wastegate in our diagram is external. 2) Exhaust gases enter the turbocharger. Exhaust gases leave your engine through the exhaust manifold and enter the turbocharger. The turbocharger spins and pulls in cool intake air. 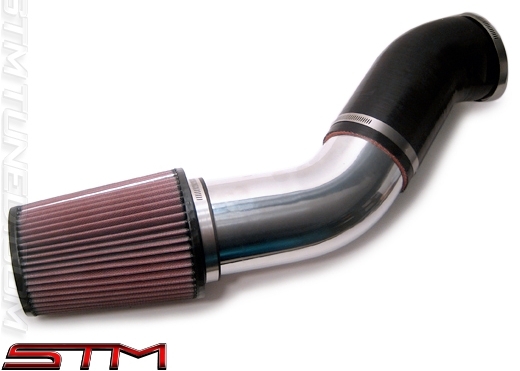 This cool intake air is pressurized, leaves the turbocharger and begins making its way to the intercooler. After the exhaust gases have been used to spin the turbine, they leave the turbocharger and make their way to your tail pipe through the downpipe. 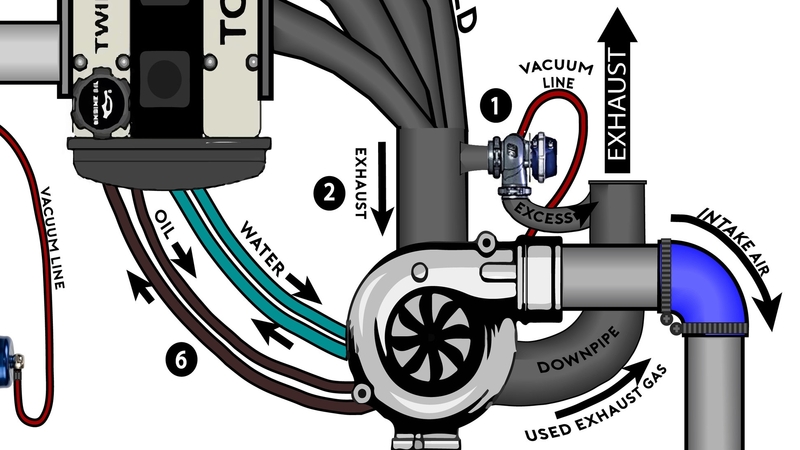 Note: there’s usually an intake pipe with a filter attached to the front of the turbocharger, though it’s been left out of this diagram. 3) Intake air goes through the intercooler. 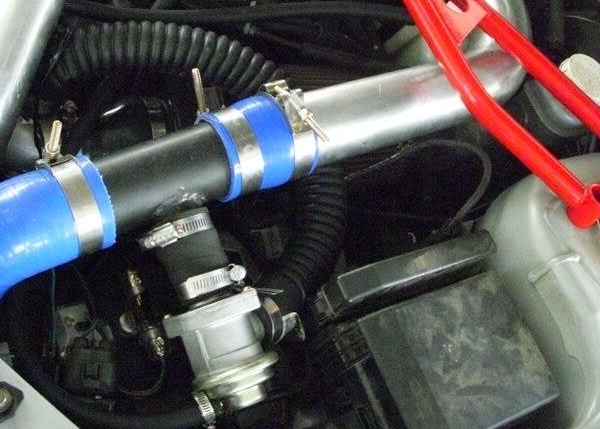 Pressurized intake air leaves the turbocharger and makes its way to the intercooler through a series of pipes. 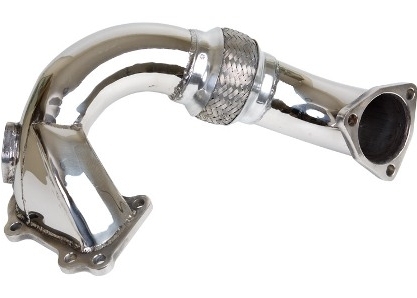 In aftermarket applications, these pipes are usually held together using silicon couplers. 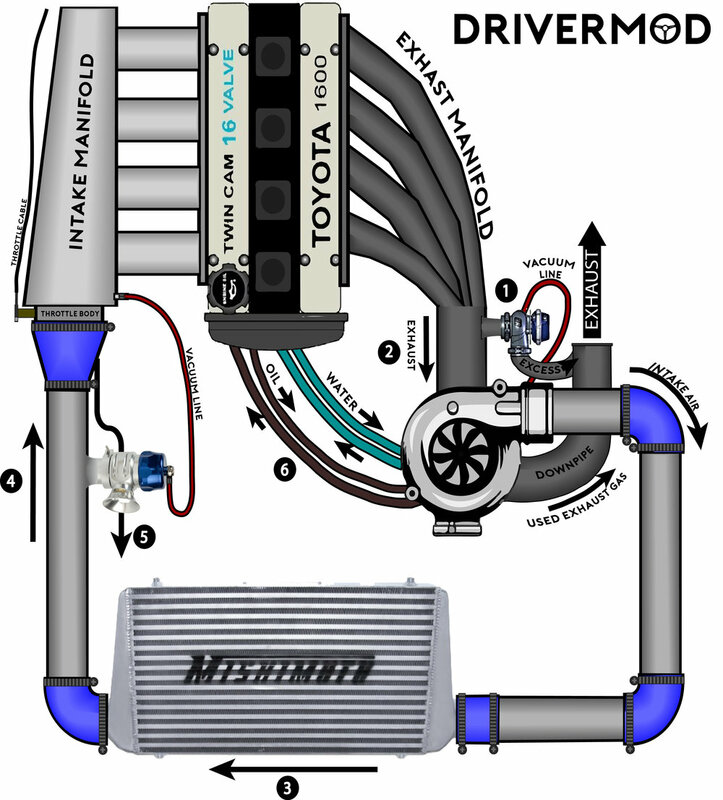 (blue in our diagram) It then goes through the intercooler, which cools the intake air. The colder the intake air is, the denser it is, and the more power you’ll produce. You usually want to make this piping as short as possible. In theory, the shorter it is, the less lag you’ll experience. 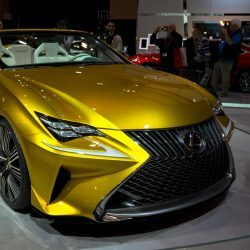 Turbo lag: the time delay between when you step on the throttle pedal, and the turbocharger provides an increase in intake manifold pressure. Here’s where the magic happens. Cold, dense, air leaves the intercooler, enters the intake manifold, and you make POWERRRR. This only happens if the throttle body is open. The throttle body can be thought of like a door that lets air into the engine. When you put your foot down on the throttle pedal, you yank on the throttle cable, open the door, and allow air into the engine. Eventually, you’ll need to take your foot off the gas. When this happens, the throttle body slams shut, and all that boost needs somewhere to go. 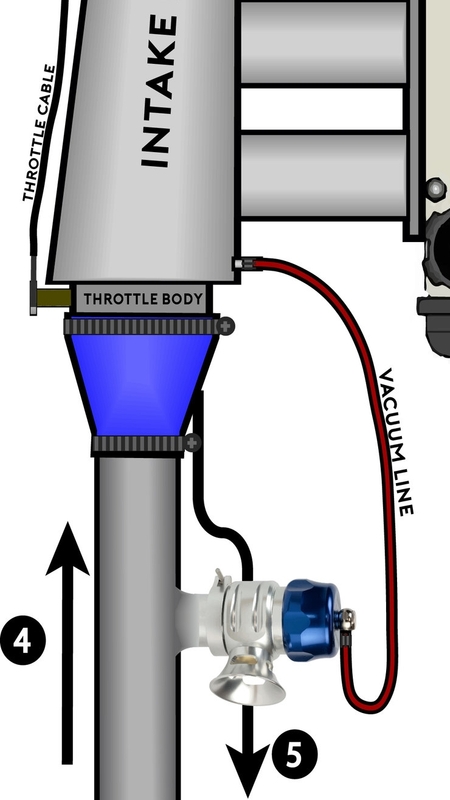 It can either be vented into the atmosphere through an atmospheric blow-off valve (like the one in our diagram) or be fed back into your intake tube (before the turbo) using a re-circulating blow-off valve. 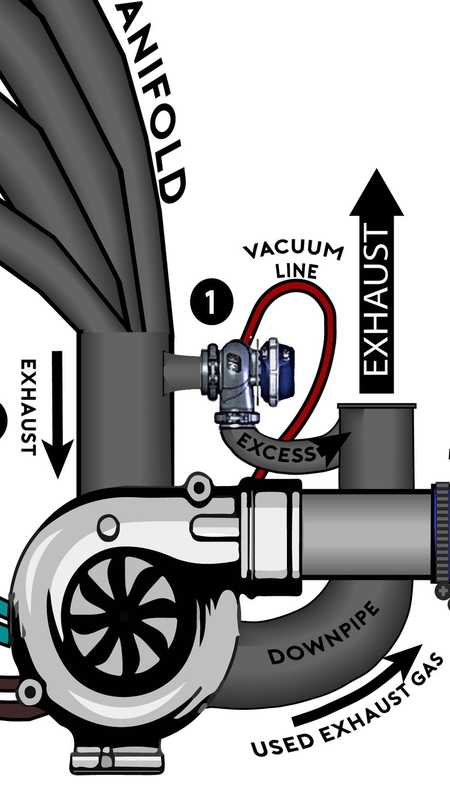 How does the blow-off valve know when to open? It’s connected to intake manifold by a vacuum line. 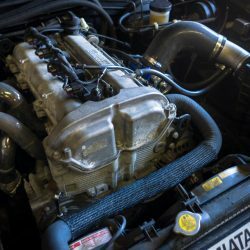 Closing throttle body creates a vacuum in the intake manifold. This vacuum pressure then pulls the blow off valve open. It’s not unheard of for turbochargers to spin to 140,000 rpm. For that reason, they need to stay cool. Pretty well all turbochargers are oil cooled, while some are both oil and water cooled. Oil cooled turbos take oil from a pressurized oil outlet on the engine (like the oil pressure sensor hole) and return it to the oil pan. For this reason, aftermarket turbo setups on naturally aspirated cars usually require you to tap a hole in your oil pan. 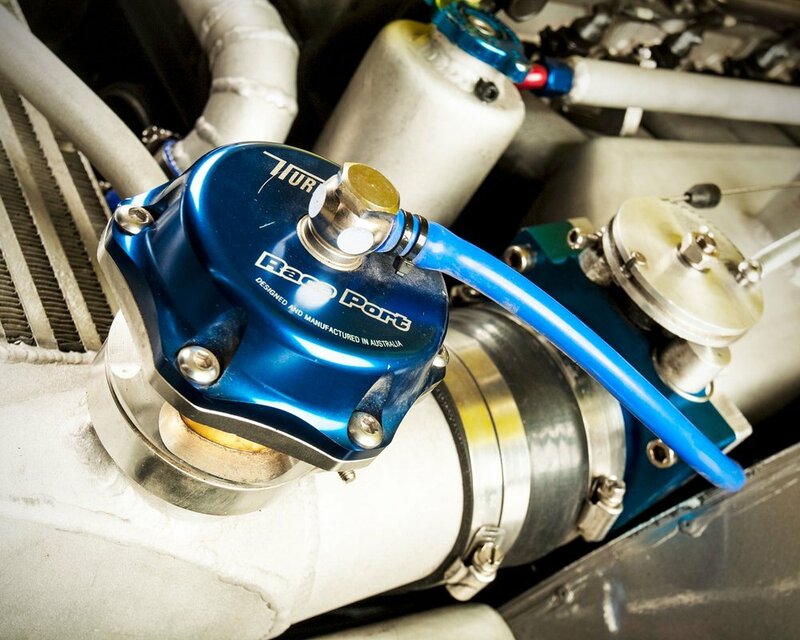 Water cooled turbos send and receive coolant from the engine’s cooling system. This is usually done using fittings spliced into coolant hoses. 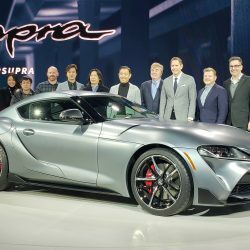 Now go out there and boost your mom’s Corolla.